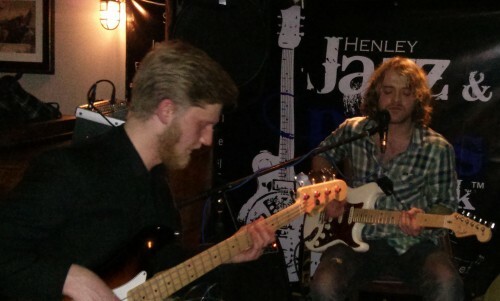 Tom Michell played at the Bull on Bell Street on Friday night as part of the Henley Jazz and Blues Week. The pub was packed as Tom started his set but unfortunately most people had not come to hear him play as evidenced by the fact that hardly anyone was watching him, preferring to continue talking – loudly – to their friends and companions and in the process making such a racket that it was quite difficult to hear Tom’s excellent music for most of the evening. A great shame because those that did pay any attention soon realised that, boy, can this guy play guitar! In the opening half of Tom’s set, the people around the stage straining to hear him heard a diverse range of songs including Hey Joe, most famously associated with Jimi Hendrix, and a slowed down blues version of Depeche Mode’s Personal Jesus – which worked really well – amongst others. After a short interval Tom switched to electric guitar and was joined by bass player Pete Thomas, which gradually seemed to help engage a few more of the pub’s clientele. The set steadily built momentum and the applause after each song got louder as more and more people realised this was great music. Tom and Pete gave some great renditions of songs such as Rick Derringer’s Rock and Roll, Hoochie Koo, Freddie King’s Big Legged Woman, Ray Charles’ I Got A Woman and Before You Accuse Me by Ellas McDaniel (aka Bo Diddley) plus many more. However, after a driving and energetic version of Cream’s Crossroads and one more number, a bluesy version of Rock’n’Roll by Led Zeppelin, Tom brought his set to a close. This was hugely disappointing – it was only just after 11pm, the watching audience had grown significantly and everyone was having a great time listening to some great music, plus the pub was still packed. So why stop playing so early? With many more folks having finally got interested another half an hour or so from Tom would have really rounded off an evening of great music, superbly sung and played. And again, even at the end, such a pity that a large proportion of patrons in the Bull didn’t seem interested in Tom’s talent.